In an age in which data is used ubiquitously to measure and analyze society (it’s what I do here regularly), it is important to recognize that numbers and metrics are always infused with implicit values. This is something we must remember when we are faced with facts or rankings of any sort; even simple statistics can rarely be presented without any sort of bias or narrative. This isn’t exactly a bad thing; narratives help us derive meaning from the world, but narratives and biases can become dangerous when we grow so accustomed to them that we approach them with thoughtless acceptance. I would even go so far as to assert that every metric and every piece of data is flawed; it is not the metrics which are most flawed of which we should be wary, but the ones with flaws we’ve ceased to recognize (GDP is one of these metrics. For further discussion about this, see my post on my senior thesis). Because of these issues, I strive in my work to constantly assess and shape the values implicit in data for the benefit of human well-being. In this vein, I have worked off and on for the past year to produce a new sort of ranking system for American cities. 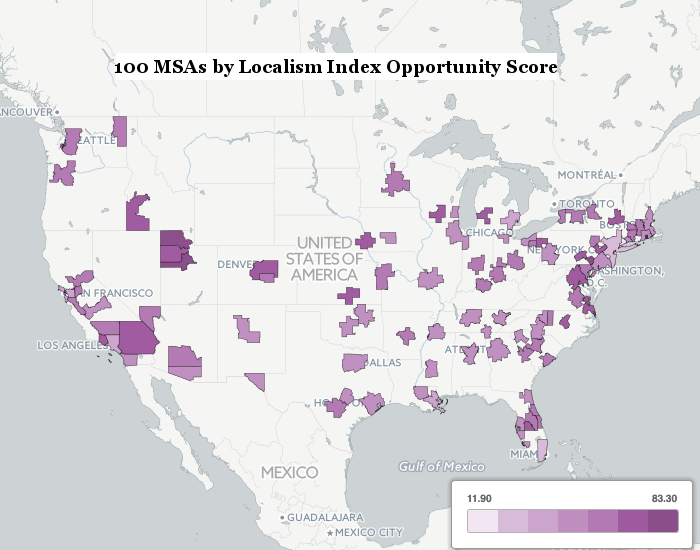 I’d like to introduce it to you now: the 2015 Localism Index. The Localism Index is based off of my work last year with the Business Alliance for Local Living Economies (BALLE), whose values provided the core components of the index. You can see detailed explanations of these values on their “Why We Work” page, but they are: Measuring What Matters, Ownership Matters, Place Matters, Opportunity Matters, Nature Matters, and Relationships Matter Most. With Measurement being more of an overarching theme, the values manifest themselves in the index as simply: Ownership, Place, Opportunity, Nature, and Relationships. 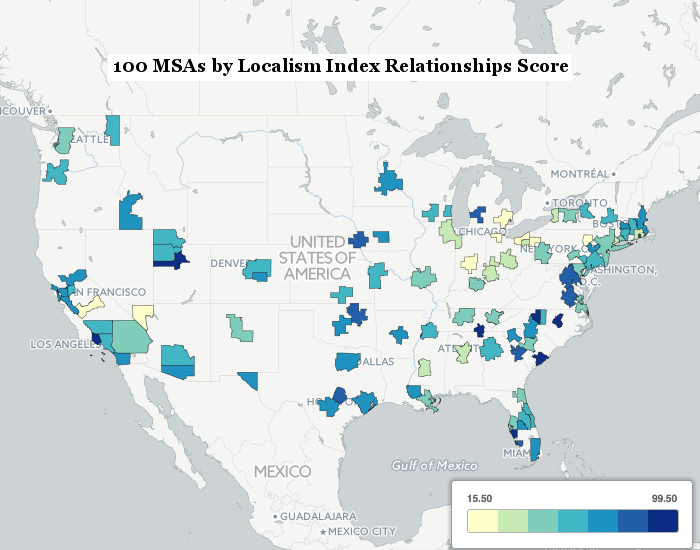 This being a Localism Index and BALLE being a local-first organization, the word “local” is, of course, a modifier for each of these values. This addendum is not just made out of preference however, as I believe that “local” places really are the key units of scale for the prospering of human life. In fact, before composing this index, I carried out extensive research to assess how each of these values implemented at a local level has an impact on quality of life and human well-being. The results, especially for the importance of local ownership, local place, and local relationships, were quite strong. In addition to the mapped results at the top of the post, you can see the full results and find your own city’s scores here. Below are the top and bottom five metro areas, and mapped results of each component. Jackson, MS came in last due to low scores in all but Local Ownership. Based on the Indie City Index, the Ownership score measures the market share of locally-owned independent businesses in a city. Darker indicates a higher score. Find the interactive version of this map here. 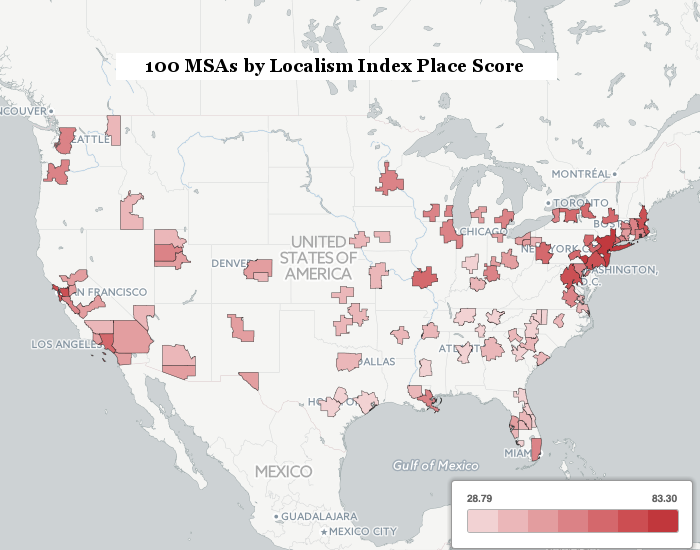 The Localism Index uses Walkscore as a proxy for Place, averaging the Walkscore for each major city within an MSA. Darker red corresponds to higher scores. Find the interactive version of this map here. For Opportunity, the Gini Coefficient is inverted and converted to a 0 to 100 scale, where the lowest scoring city=O. Here, dark purple means a city has low levels of inequality. Find the interactive version of this map here. 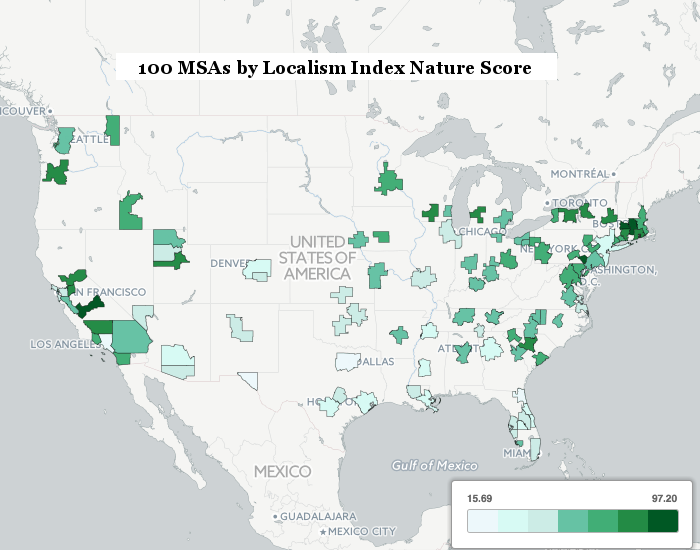 For Nature, a city-level Locavore Index is used. This is based on per capita direct-to-individual-sales of local agriculture and the number of farmers markets per capita. Here, darker green corresponds to higher consumption of locally produced food. Find the interactive version of this map here. The Relationships component is based on the Gallup-Healthways Well-Being Index. Here, yellow corresponds to low social and community scores and blue corresponds to high scores. Find the interactive version of this map here. Finally, here are the top five ranked cities in each component. Note that dark-green corresponds to scores between 80 and 100 for that metric, while medium-green denotes a score in the 60 to 79.9 range. While it is certainly not without its own flaws, I am excited to present this index to you as a different way of assessing how cities across the country are performing beyond just their housing values or median incomes. To perform well in this index, a city has to: support local, independent businesses; follow walkable or transit-rich development patterns; create income equality and opportunity for all; know its local farmers and the sources of its food; and have healthy social and community relationships. It has been a labor of love for me (I haven’t been paid for any part of this work), and part of my ongoing journey to measure what matters. I’d love to hear your feedback and further questions about the index in the comment section below! It’s great to see work like this being done! I’m glad I’m not the only one who just loves to mess around with data. Is it possible to look at this for a specific township/county/state? Instead of applying this to the entire US, maybe apply it on a state by state basis? So, do you mean ranking each state in terms of localism, or just looking at how cities stack up within each state (but showing more cities)? It would be possible, but I would have to change some of the inputs as I only have all of them for the top 100 largest MSAs. City ranking would be neat. I might do some exploring. Probably couldn’t do much smaller than the MSA level though. I could get everything except the current relationships variable for all MSAs.